​In this post, I will try to explain why splitting stories sometimes causes a sort of waste. Let’s think of a situation where we have two stories in a sprint backlog that are related. There was a business requirement and it has been split in two small related stories. And when I say related…I really mean intensely connected with each other to a point that you can’t test it separately or it does not create any usable value if you release it separately. Only when build both, there is value and a happy customer. How to split stories better? When you have related stories, you probably split them wrong. There are several solutions and often splitting them a little different is already a solution. But sometimes splitting stories require additional extra work in your sprint. For example a contact form that should save to a CRM system. We created 2 stories for this. The form itself (story 1) and the save action to CRM (story 2). The stories are connected. They don't have much value on their own if we don't do anything. More work but less risk! ​The only reason we put some extra effort in the two stories was to make them independent. It takes sometimes effort and extra work to do that. It seems a bit like waste but actually it really helps our process. In doing more work than we should, we are in fact creating more chance in delivering real value on time and lowering the risks of impediments! Hooray! Splitting stories…why are we doing that? There are several good reasons why you want stories in your sprint to be small. I wrote an article about the traffic jam effect of big stories and you can also argue that large stories are inherent difficult to estimate so you will have problems in learning to estimate. In SCRUM, we are learning to drill down our work to good estimable little things to be as predictable as possible in time and quality. It should be less than 13 points, smaller is better. It should be releasable on its own (because sometimes we fail in the sprint goal or the PO decides not to release something). Recently I played with a traffic jam simulator (http://www.traffic-simulation.de/ ) . Great site! You can alter all kind of variables and see effect on the traffic. You can add traffic, add big trucks, alter speed (and desired speed!) All these things that will influence the traffic (and the traffic jam). Really fun and interesting! I had a discussion the other day with the customer about our velocity in the sprint and the amount of work I (and our team) allowed in the sprint. He argued that we could add more, just to make it more a challenge. In fact, I think he thought we were a bit lazy or at least cowardly. So I replied with this traffic jam metaphor. ​A sprint is like a busy road! The stories in our sprints are like cars on a road. We have big cars, small cars, quick cars (easy) and slow cars (difficult). And we all have a time schedule because we want to be on time, in the end, with everybody! Look at a real traffic jam. If a car will break down and the road is already very busy, this will be probably cause a traffic jam. There is no room for the other cars to find alternative routes or place. Also many trucks will have effect in the efficiency of all the traffic. You can play and see for yourself with the simulator. Most important one: Keep the amount of stories (or work) in total reasonable, so there is room to move/find alternatives if needed. You want to be accountable and predictable so you need a realistic pace. You need room to move if something happens. And trust me...something will happen. Prevent much difference between the speed of cars/stories. Try to keep the stories small. You don't want Roadtrains in your sprint. You need a procedure what happens if a car (story) will break down (crash). It can not block the road so you must get it out of your way somehow. This also explains why it is a good idea to poker a little bit more in a session than you have room for, just to have some spare stories to switch with others to make a good sprint planning. It was only a matter of time, I know. 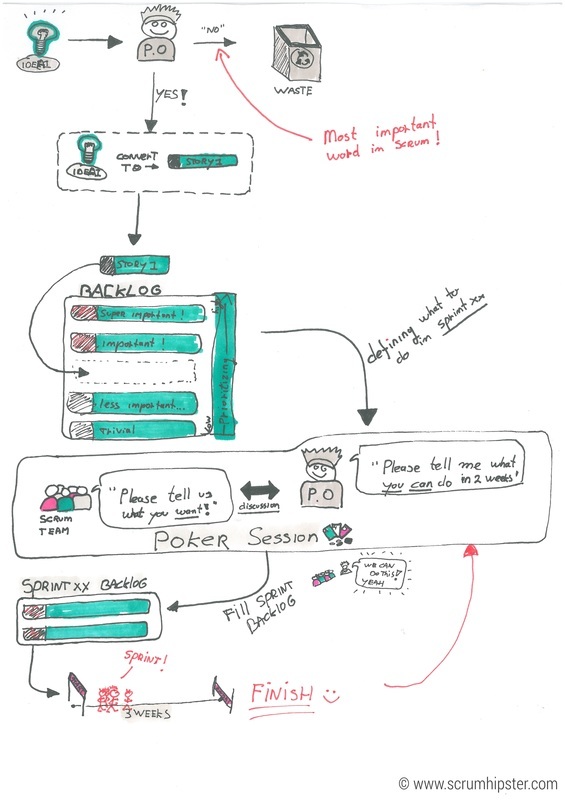 But here it is, Scrumhipster about the daily scrum, or daily standup or just standup. I don't care how you call it. A nice, 15 minutes of conversation with your team, discussing what we are going to do and how we are doing. The "development team synchronize activities and create a plan for the next 24 hours". Simple as that. We will tell each other what we have done, what we will do and if we having impediments related to our sprint goal. The scrum master makes sure we are able to have the daily scrum and the scrum master learns the team how to do the best daily scrum. And...only the development team. Such a simple meeting but in reality for some mysterious reason so difficult! A top 3 of things we are doing wrong. Only the development team: In reality I see not only the product owner attending but even project managers, account managers, stakeholders from the customer. You name it... And worse, they all want to say something. And that is very annoying because they often say nothing relevant of related to our sprint goal and they keep us from being quick. So scrum masters...enforce this rule! Talk to each other! They care. The scrum master (if he helps you with the daily) does not necessarily. We often only talk only to the person who is the chairman of the daily scrum, but there should be no chairman. You should tell each other what you are going to do. Ow great scrum hipster...how can we do this? Tell your scrum master that you want him to learn you (and the team) how to do a proper daily scrum. Tell your scrum master (or do it yourself) to remove everybody from the daily who is not in the development team. A good practice is to have a separate meeting with the removed people now and then to keep them informed about the progress, but this can be done by the scrum master and not the whole team. Start forcing a group conversation. Start with identifying the problem: tell the team there should be no chairman and scrum master, stop acting like one! In my experience it is best for a scrum master to really learn the team how to do this. At least don't let anybody decides who will talk. This creates some sort of chairman and you don't want this. Everybody should help each other to only say relevant stuff. There is no room for technical blabla. Talk about your daily in your retrospective meeting. One final thing. If somebody will say something like "I will work on the backend code today", during the daily scrum, kick him. This makes no sense and is not giving the team a chance to inspect or adapt because you still have no clue how the team is doing. 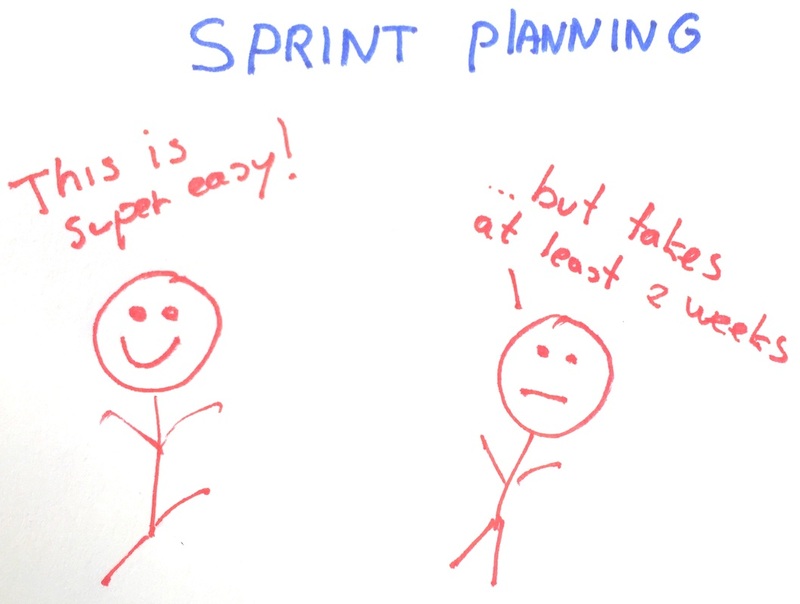 It doesn't show all, mainly the what and how of the sprint itself is not drawn, but it gives some insights of the things a Product Owner should do. I made some extra remark at the denial ( "no") of some ideas by the Product Owner. I really think this is super important so the team only will work on things the PO himself decided that should be done. Otherwise you will have a situation that the team will build something the PO himself is not rely believing in and is unable to give to right instructions about what to build because he does not really believe in it. Sometimes I have a discussion with my team about so called 'losing points'. If you don't finish a story on time (in your sprint) but already did some work of the last story, you will lose some points. Sometimes our team tries to capture those points anyway in the velocity but I will explain why you shouldn't and why that is not a problem at all. Currently we are working in sprint 5. You (or we) did not complete your sprint at time :( There was this one nasty story that appeared so easy but was in the end gigantic complex. Your team say they finished 50% of the story and the story was estimated 8 points. Your goal was to complete 30 points in total but you only finished 22 points in sprint 5. You velocity was not 26 points (22 points finished + 4 points partly finished). You did not earn 4 points by doing 50% of the 8 points story. You only receive points for stories you finish. So your velocity in sprint 5 is 22. The estimation of 50% finished of the 8 points story is probably just a wild guess of your team. For some reason the original estimation of 8 was already wrong, so there must be something wrong with the estimation. Perhaps the story is too big to make a good estimation? In this example our team gathered together in the next sprint planning and I asked them "how many points it would take to finish this story taken everything (new knowledge, work already did) into account". The team estimated the specific story 6 points to finish. 2 less that the original estimation (8 points) and 2 more than what they initial thought. They learned much about the story in the last sprint and, after the new discussion, they found out they do not did finish 50% but only 25%. The sprint planning was ideal to have the discussion about the story to get new insights. So what about the work in Sprint 5? What about the 50% of the 8 points story? Where are our 4 points? Well nowhere really! They are just lost. There is no artefact in Scrum where you report unfinished work. And that is completely ok! You should realize that in Scrum much of the reporting is seen as waste. When you want to know how much progress you make, you look at finished (releasable) stories, not at the amount of points you have finished. Points and velocity are tools for a team to help them to be predictable about the amount of work they can finish. They are just tools! It is not a reporting tool for progress. Keeping that in mind makes losing points not really a problem anymore, does it? On top of that there is another argument not to cheat with points. Pretending you did finish 4 points (50% of the 8 points) will actually stop you from learning about your possible velocity at all! If velocity means what your team can finish, adding points of unfinished stories doesn't make sense. When we decided in our team we wanted to start with points instead of hours someone introduced something called complexity points. Based on a theory he explained that this should work better. In this theory there is a complex formula to predict complexity of user stories. Long story short, we started using the term complexity points instead of hours. Of course, this was difficult for most of the team. It took just a couple of weeks until we had some kind of formula where 1 points was equal to 1 hour. That was not working well :( After a few retrospectives and some adjustments the problems were solved by stopping talking about hours completely and just doing a couple of sprints. That's right, just by doing nothing particular the team learned and adjusted. The other issue we did not foresee. Because we used the term complexity points I noticed that our team had started to have problems with the meaning of the word complexity. Complexity for most people mean how difficult something is, and that is different for everyone. On top of that, I received questions how we should estimate a story that is easy to do, but takes a lot of time. With the complexity points the estemation was only a couple of points but that would result in an unrealistic amount of work in our sprint. It was just not the right way. It was clear to me that our problems came from using the term complexity. The word has such a strong meaning that we were unable to use it in a other context. Nowadays I coach our teams to estimate in effort or energy points. Those points are defined as (complexity X time) = effort. I ask the team to give their feeling on how much energy a story would take the team. That works much better. So, what did we learn? Try to stay away from strong (subjective) terms like complexity in your Scrum. Make sure your team knows (and remembers) how the terms are defined and keep repeating that every planning session. It creates some sort of hierarchy in your team when someone determines which specific task you should do. It creates a blame culture. When you don't finish your task on team someone tells you that is bad. But the only thing that can be bad if the whole team can't succeed in finishing the sprint, instead or individual tasks. It prevents the team to manage them theirself and complete the stories the way the team wants to. It disrupts the peace in the team. In my opinion day goals are a sign of absence of trust. The Project manager or Scrum manager does not trust the team in completing the sprint theirself so decides to take control. Absence of trust is one of the key aspects of a dysfunction team. Please do read The Five Dysfunctions of a Team by Patrick Lencioni for more great information about these problems and how to fix them. 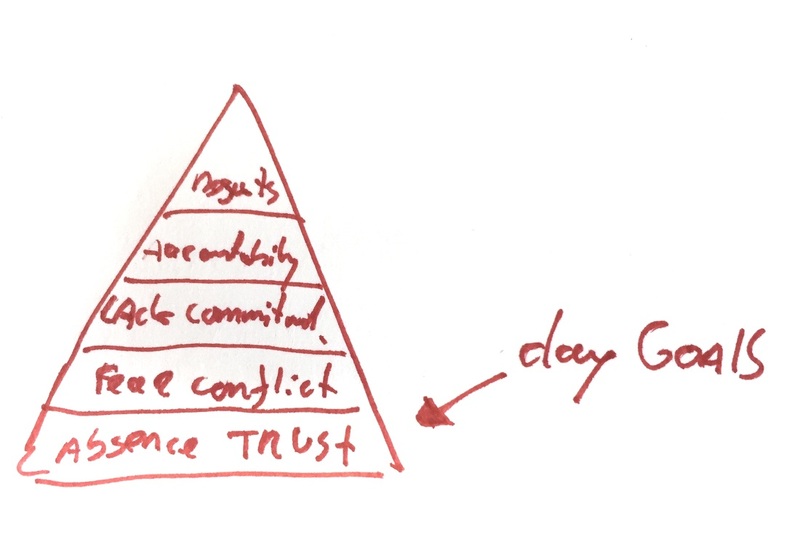 I would start with addressing the trust problem very seriously by discussing this with the whole team. In my next article I will give you some advice how to work on your trust problem.